3. University of Chinese Academy of Sciences, 19A Yuquan Road, Beijing 100049, China. Iron oxide nanoparticles have been widely used in many important fields due to their excellent nanoscale physical properties, such as magnetism/superparamagnetism. They are usually assumed to be biologically inert in biomedical applications. However, iron oxide nanoparticles were recently found to also possess intrinsic enzyme-like activities, and are now regarded as novel enzyme mimetics. A special term, “Nanozyme”, has thus been coined to highlight the intrinsic enzymatic properties of such nanomaterials. Since then, iron oxide nanoparticles have been used as nanozymes to facilitate biomedical applications. In this review, we will introduce the enzymatic features of iron oxide nanozyme (IONzyme), and summarize its novel applications in biomedicine. Keywords: Iron oxide, Enzyme-like activities, Nanozyme, Enzyme mimetics, Biomedical applications. Iron oxide nanoparticles are a well-established nanomaterial, with extensive use in biomedical applications thanks to their special magnetic properties at nanoscale. While typical iron oxide particles show coercivity and remanence (retentivity) in bulk form, they tend to display paramagnetic or superparamagnetic magnetization behavior at nanoscale. Thus, iron oxide nanoparticles easily aggregate in the presence of an external magnetic field, but also re-disperse readily upon its removal. Given this magnetic property (superparamagnetism), iron oxide nanoparticles have found application in various fields, especially in biomedicine, including bio-separation and purification, biosensors, transfection, magnetic resonance imaging (MRI), hyperthermia therapy, and targeted drug delivery [1-5] (Figure 1). It also serves as an ideal platform for customizing diagnostic imaging and targeted therapy together for theranostic treatment [6, 7]. Several types of superparamagnetic iron oxide (SPIO) nanoparticles have already been approved by the FDA to facilitate their translation from bench to clinic [8, 9]. In all these applications, iron oxide nanoparticles are generally assumed to be biologically inert, or they are coated to avoid unintended activity. In 2007, it was discovered that ferromagnetic (Fe3O4) nanoparticles showed intrinsic peroxidase-like activity, with catalytic behavior similar to horseradish peroxidase (HRP) . This was the first time an inorganic nanoparticle was considered as an enzyme mimetic for biomedical applications. This original work initiated the discovery of a variety of nanomaterials with enzyme-like activities, including metals, metal oxides, and metal-carbon compound nanomaterials with catalytic properties similar to peroxidase, haloperoxidase, NADH peroxidase, catalase, oxidase, glucose oxidase, sulfite oxidase, and superoxide dismutase [11-17]. More importantly, these catalytic nanomaterials may become a new generation of artificial enzymes or enzyme mimics [18, 19]. The term “Nanozyme” was introduced to define nanomaterials with intrinsic enzyme-like activities, in order to distinguish these nanocomplexes from externally immobilized enzymes . A series of novel applications have been widely developed based on the featured mimetic activity to improve human health, from diagnosis to anti-bacteria and cancer therapy, engineer the environment for pollutant monitoring and removal and refine the efficiency of chemical industry [21-25]. Now, nanozymology is becoming a novel interdisciplinary field bridging nanotechnology and biology [12, 26-31]. Iron oxide nanoparticles (iron oxide nanozyme (IONzyme) including Fe3O4 and Fe2O3) constitute one of the most typical nanozymes. The analytical methods developed for IONzyme characterization have been used to explore other nanozymes, especially for kinetics and mechanism assays to determine the catalytic properties. In addition, an increasing number of researchers are currently using iron oxide nanomaterials as enzyme mimetics and have developed many novel biomedical applications based on their enzyme-like activities. 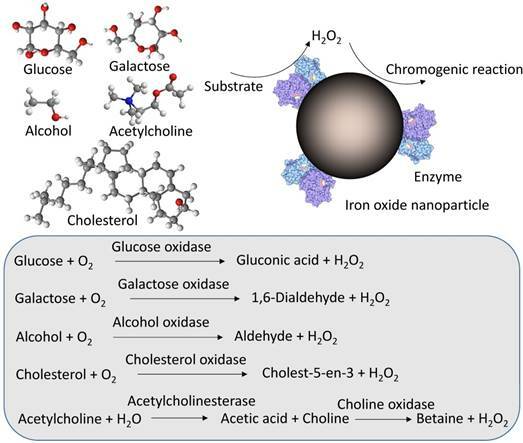 While a number of review articles concerning the general physical properties of iron oxide nanoparticles have been published [32-34], none have summarized the intrinsic enzyme-like properties for biomedical applications. To advance the concept of nanozymes and highlight the importance of IONzyme, we will systematically summarize the enzymatic properties of IONzyme and the latest biomedical applications based on its biomimetic activities in this review article (Figure 1). Typical magnetic properties and novel enzyme-like activity of iron oxide nanoparticles for biomedical applications. IONzyme exhibits peroxidase-like and catalase-like activities under physiological reaction conditions. The activities show typical catalytic features that are similar to natural enzymes, including substrate and optimal pH and temperature. More importantly, all IONzyme catalyses follow Michaelis-Menten kinetics and possess mechanisms similar to natural enzymes, confirming that IONzyme is a new type of enzyme mimetic. Currently IONzyme is reported to mimic two enzymatic activities: peroxidase (EC 1.11.1.7) and catalase (EC 1.11.1.6), which belong to the oxidoreductase family. These two enzymes contain a porphyrin heme as cofactor in their active site, and while both use hydrogen peroxide as substrate, only the former generates free radicals to react with a hydrogen donor (AH2), whereas the latter generates oxygen (Equation 1 and 2). Both peroxidase and catalase play a critical role in preventing cellular oxidative damage in aerobically respiring organisms. (1) Peroxidase-like activity of IONzyme: The first IONzyme activity found was peroxidase-like activity, which catalyzes the typical colorimetric reaction involving hydrogen peroxide (H2O2) and chromogenic reagents (Equation 1) (Figure 2A). This activity can be found in both Fe2O3 and Fe3O4 nanomaterials, whereas the latter has better activity than the former . IONzyme peroxidase-like activity requires the same optimal conditions as those for HRP, including the optimal temperature at 37-40 oC under the optimal pH (pH 3-6.5) in an acidic buffer  (Table 1). For optimal IONzyme peroxidase-like activity, the H2O2 concentration must be maintained within a proper range, because excessive amounts of H2O2 could inhibit the colorimetric reaction when 3, 3', 5, 5'-Tetramethylbenzidine (TMB) acts as the hydrogen donor. Various reports found IONzyme peroxidase-like activity for a wide range of substrates, including TMB, o-phenylenediamine (OPD), 3, 3'-Diaminobenzidine (DAB) and 2, 2'-azino-bis (3-ethylbenzthiazoline-6-sulfonic acid) (ABTS) [10, 35, 36] and even fluorescent polydopamine  (Figure 2A), terephthalic acid (TA) , luminol, and benzoic acid . In addition to these chromogenic substrates, IONzymes were shown to peroxidize biological substrates such as proteins, nucleic acids, polysaccharides  and lipids . For instance, IONzymes induce lipid oxidation using lipid peroxides (LOOH) generated from unsaturated lipids via chain reaction-propagation . Therefore, IONzymes act on a broad range of substrates. Enzyme-like activities of IONzyme. A. Colorimetric reaction catalyzed by peroxidase-like activity of IONzyme with substrates, such as TMB, DAB OPD , ABTS  and fluorescent polydopamine . B. H2O2 decomposition by catalase-like activity of IONzyme with oxygen (bubble) generation and identification with dissolved oxygen measurement . C. Michaelis-Menten kinetics for peroxidase-like activity . D. Michaelis-Menten kinetics for catalase-like activity . Reproduced with permission from references     . Like natural enzymes, IONzymes are stimulated or inhibited by some chemicals. Currently, the reported activators include ATP, ADP, AMP [42, 43] and DNA. Notably, ATP can enhance the peroxidase-like activity at neutral pH by complexation with Fe3O4 nanoparticles to participate in single electron transfer reactions . In another report, it was shown that the peroxidase-like activity of Fe3O4 nanoparticles can be improved approximately 10-fold by adsorption of ssDNA to the particles . In contrast, the inhibitors are varied, including the free radical quenchers, like sodium azide, ascorbic acid, hypotaurine and Catecholamines . Intriguingly, it was found that ssDNA and dsDNA reduce the peroxidase activity of IONzyme. This phenomenon is thought to be a consequence of the screening effect of adsorbed DNA on the surface of iron oxide nanoparticles toward OPD , indicating that this inhibition is caused by blocking the affinity of the substrate to IONzyme rather than quenching the free radicals. Therefore, the activity of IONzyme is able to be regulated by these chemicals. (2) Catalase-like activity of IONzyme: IONzyme has previously been shown to possess catalase-like activity (Equation 2) . The first report showed that both γ-Fe2O3 and Fe3O4 nanoparticles coated in dimercaptosuccinic acid (DMSA) decomposed H2O2 under neutral and basic pH conditions  (Figure 2B). While both types of nanoparticles catalyzed this reaction, it appeared that Fe3O4 possessed higher catalase-like activity. Similar to peroxidase-like activity, the pH range played a critical role in the efficiency of this reaction. The current understanding is that IONzyme mainly performs the aforementioned two activities with proper pH control. IONzyme follows the typical Michaelis-Menten kinetics, similar to both peroxidase and catalase (Equation 3). Most work related to IONzyme for determining the apparent steady-state kinetic parameters is based on the peroxidase reaction (Table 1), including the determination of KM, Vmax, and Kcat (Equation 3 and 4) to evaluate the affinity of a substrate to the enzyme (KM) and the catalytic efficiency (Kcat or Kcat/KM). Upon exposure of IONzyme to a H2O2-TMB system, it catalyzes the conversion of H2O2 and TMB following Michaelis-Menten behavior  (Figure 2C). When comparing IONzyme kinetics with that of native HRP, it was shown that the apparent KM value for H2O2 was higher for IONzyme, indicating that it possesses a lower affinity for the H2O2 substrate than HRP by approximately 41-fold (Table 1). In contrast, the apparent KM value for TMB from IONzyme was much lower than that from HRP, suggesting the IONzyme has a higher affinity to TMB than the native enzyme. If calculated using nanoparticles' molar concentration, IONzyme with the size at 300 nm (diameter) showed a level of activity 40 times higher than that of HRP . This may be due to the fact that a HRP molecule has only one iron ion, in contrast to an abundance of iron on the surface of an iron oxide nanoparticle. IONzyme also showed a catalytic mechanism similar to HRP, following a ping-pong mechanism . First, the IONzyme binds and reacts with the first substrate (H2O2) to generate hydroxyl free radicals (•OH) as an intermediate state and then the •OH captures a H+ from the hydrogen donor such as TMB. Electron spin resonance (ESR) was used to monitor the generation of •OH during the reaction and found that IONzyme could produce the same •OH intermediate, which further confirmed its similarities to peroxidase activity. These intermediates of free radicals do not have reaction specificity. Theoretically any molecules that can serve as hydrogen donors can be potential substrates in this catalytic process, potentially resulting in a wide range of applications, especially acting on various biological molecules, such as proteins, nucleic acids, polysaccharides [40, 48] and lipids . Substrates, optimal conditions and kinetic parameters for IONzyme activities. * The unit is mg L-1 s-1 of O2. While determining the mechanism for a peroxidase reaction is a standard procedure, it is more challenging to quantitatively measure the kinetics for catalase activity (Figure 2B) . A general strategy is to use oximetry to directly detect the O2 generation rate via an oxygen electrode. The rate of the reaction is proportional to the amount of molecular oxygen generated in the solution. IONzyme follows the typical Michaelis-Menten kinetics for the catalase reaction in this procedure  (Figure 2D). However, the capacity of dissolved oxygen in aqueous buffer is affected by many exterior factors, such as temperature and diffusion. Oxygen from the air would enter the solution to interfere with the measurement if H2O2 is at low concentration, and it may escape from the liquid if the reaction is too fast when H2O2 is at too high a concentration. The volumetric measurement of oxygen gas may be achieved via a volumetric bar-chart chip . Monitoring H2O2 consumption with a spectrophotometer at 240 nm [66, 67] or measuring the intermediate hydroxyl radicals trapped by DEPMPO with ESR  would be alternative methods. Taken together, a more accurate strategy is needed for the characterization of catalase-like activity. While the enzymatic properties and related kinetics of IONzyme activities are now well-established, the underlying enzymatic mechanism remains unknown (Figure 3A). In general, the catalysis of IONzyme is similar to Fenton chemistry with iron ion or chelate, as the iron plays the critical role in catalyzing H2O2 for advanced oxidation in both systems. In this process, three types of radical species are generated, hydroxyl radical (OH·), hydroperoxyl radical (HO2·) and ferryl ion (FeO2+). The former two radicals have been observed in IONzyme catalysis [69, 70]. However, ferryl ion, typically formed in peroxidase catalysis (compound I) , has so far not been detected. It is important to know if IONzyme also forms ferryl ion in enzymatic catalysis. Compared to the dominant free ferrous (Fe2+) ion in the traditional Fenton reagent, IONzyme has a much more complicated situation with two iron types, Fe2+/Fe3+, which are both confined and coordinated tetrahedrally or octahedrally in the crystallized nanostructure . First, the valence state of iron affects the catalytic activity, in which Fe2+ ions may play a dominant role in the catalytic peroxidase-like activity of IONzyme, affirmed by adjusting the ratio between the two types of iron using NaIO4 oxidation (increasing Fe3+) or NaBH4 reduction (increasing Fe2+), showing that increasing Fe2+ led to higher activity than Fe3+ . Second, iron may be leached from IONzyme during the reaction. 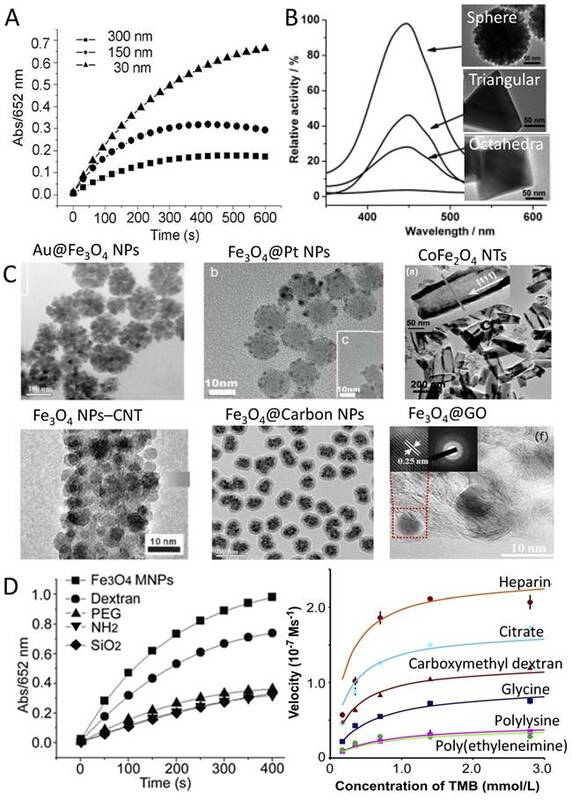 Researchers initially suspected that the peroxidase activity might be derived from free iron ions via the Fenton reaction, as opposed to catalytic activity from the nanoparticles themselves. There is indeed a trace amount of iron released from the surface of IONzyme due to the acidic dissolution at low pH in NaAc buffer. However, the released Fe content in the supernatant is around two orders of magnitude lower than the concentration required for the Fenton reaction, showing negligible contribution to IONzyme activity. It has been shown that the peroxidase-like activity arises from the intact nanoparticles rather than free iron ions [10, 36, 41, 73, 74], and thus IONzyme can be understood as a heterogeneous Fenton system, whose behavior involves kinetic processes including substrate binding, surface reaction and product release, showing similar enzymatic kinetics . Third, the iron in IONzyme is confined tetrahedrally or octahedrally in the crystallized nanostructure, which is similar to that in natural enzymes but different from Fenton reagents (Figure 3B and C). Both peroxidase and catalase contain a heme group with one coordinated iron to achieve efficient electron transfer in the redox reaction. Therefore, the confined iron in the active site of IONzyme may have electron-transferring ability. In this respect, it is rational for IONzyme to perform peroxidase-like and catalase-like activities. Finally, it is still hard to determine the precise structure of the active sites in IONzyme due to the complex environment of iron. A growing body of evidence suggests that the active sites may originate from the superficial surface. For example, changing the surface charge by molecular coating or imprinting can improve the affinity to and selectivity for the substrates [55, 76]. Furthermore, partially grafting a functional group (imidazole) onto IONzyme has improved the affinity for H2O2 in both peroxidase and catalase activity  (Figure 3D). These results only indicate that the active sites are located on the surface of IONzyme. Taken together, the characteristics discussed here indicate that IONzyme possesses the essential traits of an enzyme mimetic with the potential to be employed in a wide range of analytical tools. IONzyme can be synthesized using typical chemical methods for the synthesis of iron oxide nanomaterials, which are simple to scale up at low cost . Different synthetic strategies produce IONzymes with variable size, morphology and structure (Table 2). For instance, IONzymes made by co-precipitation usually have a relatively small size of below 30 nm in diameter [10, 35, 36, 70, 77-86]. In comparison, solvothermal preparation forms nanoparticles with larger size, from 100 to 500 nm [10, 39, 40, 48, 73, 87-93]. Other methods, such as sol-gel [77, 94], oxidative hydrolysis , thermal decomposition [95-99], and Massart hydrolysis [100, 101], can also be used to synthesize iron oxide nanomaterials with varying size and morphologies. IONzymes made by these methods therefore may exhibit different activity. In addition, surface modification can be introduced on IONzyme either during the synthetic process or after preparation, facilitating further applications in biological systems. Besides pure iron oxide, nanozymes can be integrated into other nanomaterials to form multifunctional hybrid nanocomplexes. For instance, iron oxide NPs with the diameter from 2 to 3 nm  can be deposited onto graphene oxide (GO) surfaces . They can also be integrated into hydrogel by in situ precipitation  and loaded onto silver nanowires to form a Ag@Fe3O4 nanocomposite . The above chemical syntheses allow the preparation of nanozyme at large scale with low cost, which is a notable advantage in practical application compared to natural enzymes or traditional enzyme mimetics. Mechanism for IONzyme mimicking enzyme activity. (A) Reaction pathway for IONzyme. (B) Protein structures for HRP (RCSB PDB-1HCH) and catalase (RSCB PDB-1A4E) and iron in the center of the active site . (C) Abundance of iron on iron oxide nanoparticles. (D) Mimicking the active site of natural enzyme to improve the activity of IONzyme . Reproduced with permission from references  . Some typical synthesis methods for IONzymes. Biogenic methods provide another route to making IONzymes with biomimetic mineralization  (Table 2). For example, bacterial magnetosomes are biomineralized inorganic ferromagnetic nanoparticles within the single-domain size range of 35-120 nm [127-129]. However, these nanoparticles are usually covered by bacterial membranes, which may reduce the activity. Magnetoferritin is another ideal candidate for IONzyme [124-126]. Ferritin is an iron storage protein composed of 24 subunits made up of heavy-chain ferritin (HFn) and light-chain ferritin. Ferritin is spherical, with an outer diameter of 12 nm and interior cavity diameter of 8 nm. The cavity has been used as a reaction chamber to synthesize highly crystalline and monodisperse nanoparticles through biomimetic mineralization within the protein shell. These biogenic approaches would be expected to show fine, and uniform-size particles with good dispersity and biocompatibility without extra surface modification. Although the above-mentioned varied methods for nanomaterials synthesis have been used for IONzyme preparation, there is still no report systematically comparing the activities of IONzymes made by different methods. It is a challenging task because IOnzymes have diverse size, morphology, shape, nanostructure (facets) and surface modification. Here we suggest using the concept of specific activity for enzymology to assess the activity normalized as Unit activity/mass of IONzymes from different sources. Despite its similarities with enzymes in catalysis, IONzyme has many advantages in stability, tunability of activity and multifunctionality, compared to traditional enzyme mimetics and natural enzymes because of its nanoscale effects. These features further ensure its versatile application in biomedicine. IONzyme shows enhanced stability under extreme conditions such as acidic or basic environments or high temperature, and is much more robust than natural enzymes. For instance, Fe3O4 nanozyme remained stable over a wide range of pH (1 to 12), and temperatures (4 to 90 oC) . In contrast, the natural enzyme HRP did not show any activity after treatment at pH lower than 5 and lost activity rapidly when the temperature was greater than 40 oC. This super high stability enables long-term storage of IONzyme for up to 40 days in a sealed vessel under ambient conditions to maintain good activity. In addition, it showed excellent reusability, maintaining activity after multiple times of recycled use [79, 106]. More impressively, the hybrid nanozyme of Fe3O4 nanospheres/reduced graphene oxide (Fe3O4 NSs/rGO NCs) stored at 4 °C was found to be stable for more than 3 months . However, a biosensor based on IONzyme showed shorter stability at around 2-3 weeks, but still acceptable for practical application [123, 135]. This high stability allows IONzyme to be widely used in biomedicine. One of the main features for nanozymes, compared to natural enzymes and other mimetics, is that their activity can be tuned by modulating the size, structure/morphology, dopant and surface modification [70, 136], which means that it is possible to design a nanozyme with proper activity according to the need. First, the activity of IONzyme can be modulated by controlling the size and morphology of the nanoparticles. Usually the smaller the size, the higher the catalytic activity. This phenomenon can be explained by the fact that smaller nanoparticles have a larger surface area to interact with substrates. For instance, IONzymes showed different activity towards TMB in the order 30 nm>150 nm> 300 nm when the same mass of nanoparticles was used  (Figure 4A). The same phenomenon was reproduced for Fe3O4 nanoparticles with average diameters of 11, 20, and 150 nm, that is, the catalytic activity increased when the nanoparticle size decreased . Aside from the size, the structures/morphologies also affect the activity of the IONzyme. Liu et al. reported that three Fe3O4 nanostructures, cluster spheres, octahedra, and triangular plates (Figure 4B), showed different peroxidase-like activities following the order of cluster spheres > triangular plates > octahedra. This phenomenon was closely related to their preferential exposure of catalytically active iron atoms or crystal planes . A high-energy facet like (110) may also contribute to enhancing the catalytic activity . Similarly, a magnetic cobalt ferrite (CoFe2O4) nanozyme had peroxidase-like activity following the order: spherical > near corner-grown cubic > starlike > near cubic > polyhedral . Taken together, these results indicate that it is possible to adjust the activity of IONzyme by controlling the size and morphology at nanoscale. Activity tunability based on (A) size , (B) morphology , (C) dopants/ integration with nanocomplex and (D) surface modification with different molecules [10, 55]. Au@Fe3O4 NPs , Fe3O4@Pt NPs , CoFe2O4 NTs , Fe3O4 NPs@CNT , Fe3O4@Carbon NPs , Fe3O4@GO . (NPs: nanoparticles; NWs: nanowires; NTs: nanotubes; CNT: carbon nanotube; GO: graphene oxide). Reproduced with permission from references         . Secondly, the activity could be further improved by doping with other elements in the IONzyme or integrating with other nanomaterials (Figure 4C). Several metal dopants are able to increase the activity of IONzyme, such as Au, Ag and Pt. The peroxidase-like activity of Au@Fe3O4 nanoparticles (NPs) was effectively enhanced due to the synergistic effect between the Fe3O4 NPs and Au NPs . Lee et al. reported that Au-Fe3O4 nanoparticles are catalytically more active compared to Au or Fe3O4 nanoparticles respectively, which is attributed to polarization effects from Au to Fe3O4  and the special electronic structure at the interfaces between the Fe3O4 aggregates and the gold nanoparticles . Fe3O4 coated on Ag nanowire also gives enhanced peroxidase-like activity with good stability and high absorbance . Pt-modified Fe3O4 magnetic nanoparticles (Fe3O4@Pt NPs) showed strong affinity with substrates and enhanced catalytic activity compared to Fe3O4 nanoparticles . Strikingly, dumbbell-like Pt48Pd52-Fe3O4 NPs even showed more activity than the natural enzyme . Other metals that can form metal oxide complexes with iron oxide also showed the capability to improve the catalytic activity of the nanozyme. For example, MFe2O4 (M = Co, Mn, Ni, Cu) hollow nanostructures exhibited tunable activity through adjustment of size, shape, and composition . In particular, Mn2+ doped Fe(1-x)MnxFe2O4 nanoparticles showed remarkably enhanced peroxidase activity and magnetism with increasing proportion of Mn2+ . Cobalt-doped magnetic composite nanoparticles (CoxFe3-xO4 MNPs) possessed higher activities compared with Fe3O4 nanoparticles, mimicking both peroxidase and catalase, although they were similar in crystal structure, size distribution and morphology . More impressively, a nanoreactor composed of a Fe3O4@SiO2 core-shell structure with nanochannels showed outstanding activity for H2O2 reduction compared with bare Fe3O4 or Fe3O4@SiO2 core-shell nanoparticles, because the outer silica shells with nanochannels were permeable and the Fe3O4 cores were accessible to the reactants . Most of dopants are incorporated in the synthetic process for the iron oxide nanoparticles, therefore providing a simple way to improve the activity. Another route to tune activity is to integrate iron oxide nanoparticles with carbon nanomaterials to obtain synergistic effects (Figure 4C). The integrated nanocomplexes exhibited ultrahigh peroxidase mimetic activity and better water solubility compared to those of pure nanoparticles . For instance, Fe3O4-multi-walled carbon nanotube (Fe3O4-MWCNT) magnetic hybrids could be used as an efficient peroxidase mimic catalyst that could overcome pH limitations in a Fenton-like reaction . Fe3O4@Carbon nanoparticles also have enhanced peroxidase-like activity due to the presence of partially graphitized carbon, which facilitates electron transfer in the catalytic decomposition of H2O2, leading to the production of highly reactive hydroxyl radicals [51, 122]. Synergistic structural and functional effects for combined graphene oxide (GO) and Fe3O4 nanoparticles were discovered by Zubir et al. related to the presence of strong interfacial interactions (Fe-O-C bonds) between both components . The complex had enhanced affinity toward H2O2 . In fact, the synergistic effect may be ascribed to the peroxidase-like activity of GO itself, based on the work from Qu's group . Furthermore, more complicated composites, for example graphene quantum dots (GQDs/Fe3O4), showed superb peroxidase-like activities, which were much higher than composites of GO and Fe3O4 NPs (GO/Fe3O4), individual GQDs, and individual Fe3O4 NPs. This enhanced peroxidase activity for the GQDs/Fe3O4 composites can be attributed to the unique properties of GQDs and the multiple synergistic interactions between the GQDs and Fe3O4 NPs . Reduced graphene oxide (RGO) also can improve the activity of Iron oxide nanoparticles [107, 119]. The above dopants or integration strategies provide a variety of ways to improve the activity of IONzyme. Third, surface modifications can regulate the activity of IONzyme in many ways (Figure 4D). In the early stage of investigation, our group observed that the enzyme activity of modified Fe3O4 MNPs decreased after modification in general. But the degree of decrease was different according to the molecules and methods. Dextran-modified Fe3O4 NPs (modified during synthesis) showed comparable activity to naked samples. However, polyethylene glycol (PEG) modification (during synthesis) dramatically decreased the activity, which is similar to the effects of SiO2, 3-aminopropyltriethoxysilane (APTES) coating (after synthesis) . Furthermore, the activity could be affected by surface charge from coating molecules (Figure 4D). It was found that iron oxide nanoparticles with negative surface charge (heparin coated) exhibited a 5.9-fold higher peroxidase activity than those with positive charge (ethyleneimine) when TMB was the substrate. However, the converse result was found, displaying an 11.5-fold increase in catalytic activity for nanoparticles with positive charge when ABTS was the substrate. In addition, for similar charge, lower thickness would increase the catalytic efficiency, indicating there is competition between thickness and charge effects on activity . These results indicate that the influence of surface modification on nanozyme activity is complicated, with multiple factors. The activity could be improved by modifying IONzyme with molecules having structures similar to the active site of natural enzyme. Prussian blue modification could effectively improve the activity, as the Prussian blue molecule itself exhibits high peroxidase activity [56, 141]. Porphyrin-derivative functionalized Fe3O4 nanocomposites exhibited ultra-high peroxidase-like activity with enhanced affinity toward H2O2, compared with pure Fe3O4 nanoparticles . The catalytic activity was further enhanced by the attachment of β-cyclodextrin polymer (Pβ-CD) on the surface of the Fe3O4 . Histidine modification effectively enhanced the affinity toward H2O2 for IONzyme, because the imidazole group from histidine can provide a microenvironment similar to that in the active site of HRP . The biomimetic modification may be a new way to improve the selectivity of IONzyme. Finally, modification or integration with biomolecules also effectively enhance the activity of IONzyme. 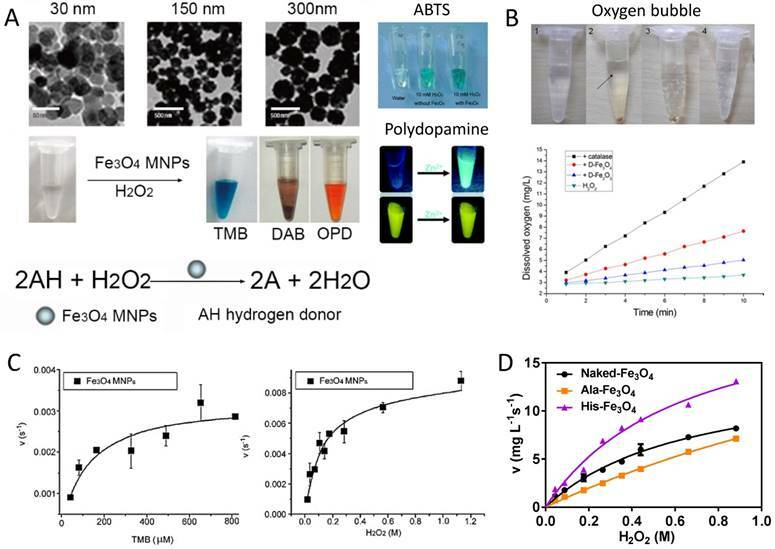 DNA-capped iron oxide nanoparticles are nearly 10-fold more active as a peroxidase mimic for TMB oxidation than naked nanoparticles, and the enhancement is related to the length of DNA . Natural biomacromolecules, like magnetoferritin, in which apoferritin surrounds Fe3O4 nanoparticles, exhibit a peroxidase-like activity that is tunable via loading a range of iron content [125, 143]. Interestingly, compared with bare magnetic nanoparticles (MNPs), peroxidase-like casein-MNPs exhibit good catalytic properties, as casein incorporated on MNPs notably improved the affinity toward both H2O2 and TMB . In summary, the activity of IONzyme could be regulated by size, structure/morphology, dopants/integration and surface modification, which is one of the biggest advantages compared to other enzyme mimetics. In general, IONzymes are all magnetic nanomaterials with superparamagnetism, while enzyme-like catalysis is another novel common nanoscale feature for iron oxide nanomaterials. Therefore, IONzymes possess two basic functions: enzyme-like activity and superparamagnetism, enabling multi-purpose performance, especially when combined together. Regarding the enzyme-like activities, IONzyme can mimic peroxidase and catalase activities at acidic and neutral pH respectively . Therefore, the activity can be easily controlled by pH under special circumstances, like in tumors or biofilms. More importantly, IONzyme can be used as a universal vehicle to load other functional molecules or reagents in an attempt to construct cascade reactions. For example, glucose oxidase (GOx) can be conjugated onto the surface of IONzymes to form a new nanocomplex. GOx catalyzes glucose to generate hydrogen peroxide, which then can be catalyzed by nanozymes to induce a colorimetric reaction. By two-step catalysis, the nanocomplex can perform sequential reactions using glucose as the initial substrate . All these features indicate that IONzyme is a novel and multifunctional enzyme mimetic, which has given IONzyme a number of advantages in practical applications, especially in the field of biomedicine. The utility of iron oxide nanomaterials no longer seems to be confined to their magnetic properties. The discovery of enzymatic activity from IONzyme provides an opportunity to use it as an active nanomaterial in the biomedical field. Currently, most applications have been developed based on the peroxidase-like activity, which is able to amplify the detection signal by colorimetric reaction and generate free radicals to kill bacteria and cells or interfere with the ROS level. Regarding peroxidase-like activity, the primary application was the use of IONzyme to replace HRP in the enzyme-linked immunosorbent assay (ELISA) and other HRP-related molecular detection methods [144, 145]. IONzyme can be directly used as an HRP alternative by conjugating with antibodies to amplify the signal via a colorimetric reaction (Figure 5A). In addition, it can be applied to capture or enrich trace-amount antigens based on its superparamagnetism, which helps to improve the sensitivity and efficiency . For example, a capture-detection immunoassay based on chitosan-modified magnetic nanoparticles (CS-MNPs) has a detection limit of 1 ng/ml for carcinoembryonic antigen (CEA) . It has been successfully demonstrated in sandwich ELISA and direct ELISA (Figure 5A-C). Right now many antigens or pathogens have been detected by these novel immunoassays, including IgG, hepatocellular carcinoma biomarker Golgi protein 73 (GP73) , human chorionic gonadotropin (HCG) , mycoplasma pneumonia , Vibrio cholera, rotavirus , and cancer cells with human epidermal growth factor receptor 2 (HER2) [105, 149] and epidermal growth factor receptor (EGFR) . Novel immunoassays and pathogen detection based on IONzyme. (A) Regular immunoassay . (B) Nanozyme-strip for Ebola detection . (C) Virus detection with sandwich format . (D) DNA detection via hybridization . (E) Bacteria detection via aptamer recognition . Reproduced with permission from references     . Recently, a lateral flow test was developed using an iron oxide nanozyme-strip to detect Ebola virus (EBOV)  (Figure 5B). This nanozyme-strip can detect the glycoprotein of EBOV at as low as 1 ng/ml, which is 100-fold more sensitive than the standard strip method (colloidal gold strip). In addition, the sensitivity of the nanozyme-strip for EBOV detection and diagnostic accuracy for New Bunyavirus clinical samples is comparable with ELISA, but is much faster (within 30 min) and simpler (without the need for specialized facilities). The results demonstrated that the nanozyme-strip test can rapidly and sensitively detect EBOV, providing a valuable simple screening tool for diagnosis of infection in Ebola-stricken areas. Besides immunoassays via antibody-antigen recognition, other detection strategies have been developed based on molecular recognition using DNA or aptamers. DNA hybridization can be achieved on the surface of IONzymes coated with the proper primer or probe. Then the primer can be used to amplify the target DNA by PCR in combination with another biotinylated primer. IONzyme still maintained high activity after many thermal cycles in the PCR reaction. Therefore, a sandwich assay can be developed on a surface coated with streptavidin (Figure 5D) and achieve signal amplification via IONzyme catalysis. Thiramanas et al. have used this system to detect Vibrio cholerae (V. cholerae) with a sensitivity of 103 CFU/ml, displaying high specificity and efficiency for the detection of various bacterial DNAs in drinking and tap water. However, DNA may have an inhibiting effect on the activity of IONzyme. The presence of a large amount of DNA was found to effectively reduce the colorimetric reaction in the IONzyme-H2O2-OPD system . Therefore, this inhibition of the color signal can be used to evaluate the target DNA after PCR amplification, by which Chlamydia trachomatis in human urine was successfully detected. Aptamers also can be used in a similar way as they specifically recognize target molecules with high affinity (Figure 5E), working like antibodies to form the typical sandwich structure with antigens. 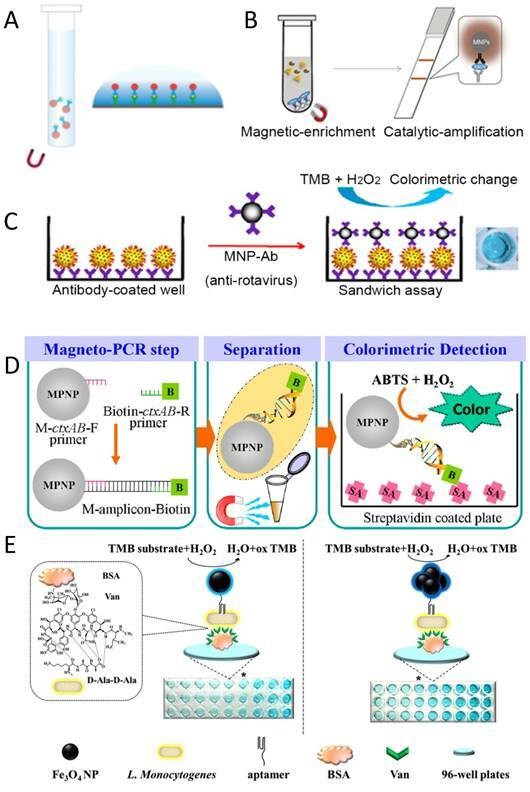 Therefore, it is rational to obtain sensitive detection for many targets, such as thrombin  and Listeria monocytogenes (L. monocytogenes) in food bacteria detection . Altogether, many immunoassays and molecular detection methods have been successfully developed using IONzyme as an HRP alternative, showing very promising application in biomedicine. However, at present there is still no real product or kit developed based on IONzyme for immunoassays. Enzymes can be assembled onto IONzyme to perform cascade catalytic reactions from enzymes to iron oxide nanoparticles if the enzyme can generate the intermediate H2O2. The integration may improve the catalytic efficiency by the proximity effect, which helps to overcome diffusion-limited kinetics and intermediate instability . The Wei and Wang group first reported combining glucose oxidase (GOx) with Fe3O4 nanoparticles for glucose detection (Figure 6). In this system, GOx catalyzes glucose to generate H2O2, which in turn is catalyzed by iron oxide nanoparticles through their peroxidase activity. If a chromogenic substrate is present, a color signal can be produced in proportion to the glucose concentration . In this way, a typical glucose concentration-response curve with as low as 3 μM glucose detection was achieved, with a linear range from 50 μM to 1 mM. Since then, many groups have used this method to combine GOx with or integrate GOx on IONzyme for glucose detection [39, 49, 59, 81, 84, 91, 95, 121, 122, 128, 131, 142, 155-160]. In particular, other nanomaterials with intrinsic GOx activity can be integrated with IONzyme to form specific artificial enzymatic systems. For example, Au nanoparticles with GOx activity can be assembled on the surface of iron oxide nanoparticles with peroxidase activity to produce sequential reactions . This functional unit can be used as a robust nanoreactor to perform a self-organized cascade reaction, which can detect glucose concentrations in a linear range from 10 to 130 μM with a detection limit of 0.5 μM. All these systems have the potential to be used to measure blood glucose levels in Diabetes diagnosis. Cascade enzymatic reactions for substrate-based detection. Alternatively, other oxidases that generate H2O2 as an intermediate can be integrated with IONzyme to detect corresponding substrates other than glucose, including cholesterol oxidase (ChOx) for cholesterol [155, 161], galactose oxidase (Gal Ox) for galactose , and alcohol oxidase (Al Ox) for alcohol  (Figure 6). A more complicated system could be used to detect acetylcholine (ACh) by combining IONzyme with acetylcholine esterase (AChE) and choline oxidase (CHO), which can sequentially catalyze ACh to form H2O2, in turn catalyzed by IONzyme for the colorimetric reaction  (Figure 6). This triplicate cascade system also can be used to detect organophosphorous pesticides and toxic nerve agents, which inhibit the enzymatic activity of AChE to produce H2O2 . Therefore, the absorbance signal from the colorimetric reaction is in inverse proportion to the concentration of organophosphorus compounds including acephate, methyl-paraoxon and Sarin (neurotocix). Taken together, the concept of integrating other enzymes with IONzyme to construct a cascade system provides a new strategy for the rapid and sensitive detection of small molecules taking part in one of the sequential steps. Besides immunoassay for the detection of tumor biomarkers or cells, IONzyme shows potential application for tumor diagnosis and therapy. First, tumor pathological analysis can be achieved with magnetoferritin nanoparticles (M-HFn) , a specific type of IONzyme. Iron oxide nanoparticles are encapsulated inside the recombinant human heavy-chain ferritin (HFn) protein shell, which binds to tumor cells that overexpress transferrin receptor 1 (TfR1) (Figure 7A). The Fe3O4 core catalyzes the oxidation of peroxidase substrates in the presence of hydrogen peroxide to produce a color reaction that is used to visualize tumor tissues. Almost 474 clinical specimens from patients with nine types of cancer were examined and verified that these nanoparticles can distinguish cancerous cells from normal cells with a sensitivity of 98% and specificity of 95%. This result suggested that ferritin-based IONzyme has the potential to become a diagnostic tool for rapid, low-cost and universal assessment of malignant tumors. IONzyme also shows the potential for direct tumor elimination. Usually, iron oxide nanoparticles are used as a contrast agent for cancer imaging or carrier for targeted drug delivery. The enzyme-like activity of iron oxide nanoparticles has been neglected in tumor therapy for a long time. Theoretically it can affect tumor viability by catalyzing H2O2 to generate toxic radicals, but the intracellular amount of H2O2 may not be enough to sustain an anti-tumor effect. To address this problem, two options can be considered: direct injection of H2O2 into the body or combining an enzyme to generate H2O2 using an in vivo substance as substrate. The first way has been proved using magnetite Fe3O4 nanozyme and H2O2 in a mice model bearing subcutaneous Hela tumors  (Figure 7B). Significant inhibition efficacy on tumor growth was shown by the combination of Fe3O4 NPs and H2O2 after treatment. Tumor imaging was also achieved by combining the enhanced T2-weighted signal from Fe3O4 in MR imaging, indicating that IONzyme could be used for cancer theranostics, especially in epidermal diseases. However, H2O2 injection in this model may not be a practical option due to the potentially high toxicity for normal tissue. In comparison, integrating an enzyme that can consume a cellular substance to generate H2O2 may be a better way, because the system can make H2O2 locally and therefore with low toxicity to normal tissue. More strikingly, recent studies showed that the iron itself within nanomaterials can cause enough ROS to lead tumor cells into apoptosis (also called ferroptosis)  or induce pro-inflammatory macrophage polarization in tumor tissues to inhibit tumor growth . No external H2O2 administration is needed in these tumor therapies. Such anti-tumor effects may be ascribed to the catalytic activity of iron in nanomaterials, which is the same as IONzyme. It is also possible to track the distribution of IONzyme in tumor therapy. Quantitative analysis of the bio-distribution, pharmacokinetics and organ clearance in animal models is important to understand the in vivo behavior and evaluate the biosafety of IONzyme. Histochemical visualization of IONzyme in mouse tissues would be demonstrated by employing its intrinsic peroxidase activity, which could catalyze the oxidation of peroxidase substrates to produce a color reaction at the onset of nanoparticle injection (Figure 7C). Based on this principle, dextran-coated Fe3O4 nanoparticles were found to mainly be localized in liver, spleen and lung rather than kidney, lymph nodes and thymus . In combination with H&E staining, cellular location was further examined to show that the nanoparticles were taken up mainly by the reticuloendothelial system (RES) in these organs, which involves Kuppfer macrophage cells in liver, alveolar macrophages in lung and macrophage perifollicular areas in spleen. Organ clearance also could be evaluated in the same way, showing the uptake and then rapid clearance with different time windows. This approach provides more detailed information about distribution and location compared to in vivo imaging, which can be used to match up with MRI analysis to better understand the in vivo behavior of iron oxide nanomaterials. Presumably, the use of other nanoparticles having intrinsic peroxidase activity in a similar way could also be considered to track their in vivo behavior. Altogether, IONzyme shows great potential in tumor diagnosis and therapy and ex vivo tracking for bio-distribution evaluation. In the catalytic process, IONzyme reacts with H2O2 to generate free radicals (intermediate product) which are highly toxic to bacteria because they attack cell membranes, proteins and nucleic acids and finally induce bacterial malfunction. Hydrogen peroxide is a common biocidal chemical with various cleaning and disinfectant uses, including as an anti-bacterial agent for hygienic and medical treatments. The mechanism is also through the reaction of H2O2 with cell components, but the efficiency is usually low for resistant bacteria. Regarding the Ping-Pong mechanism, IONzyme with peroxidase activity may help to enhance the antibacterial effects of H2O2. The enhancement effect has been demonstrated on Escherichia coli (E. coli)  and methicillin-resistant Staphylococcus aureus (MRSA) . This antibacterial property showed a beneficial effect for wound healing associated with bacteria-infected abscesses and other treatment modalities against multiple-drug-resistant bacteria. IONzyme activity for tumor diagnosis and therapy. (A) Tumor assessment with magnetoferritin . (B) Tumor therapy and imaging with IONzyme . (C) Nanoparticle distribution via enzyme-like activity . Reproduced with permission from references   . The enhancement of H2O2 catalysis to generate radicals also provides an opportunity to eliminate biofilm, a special bacteria community that helps bacteria to develop drug resistance by limiting the penetration of antibiotics or other biocides into the protective, organic matrix (Figure 8). Fe3O4 nanozyme with peroxidase-like activity could potentiate the efficacy of H2O2 in biofilm degradation and prevention via enhanced oxidative cleavage of biofilm components (model nucleic acids, proteins, and oligosaccharides) in the presence of H2O2 . The combination of Fe3O4 nanozyme with H2O2 cleaved nucleic acids (DNA), proteins (BSA, antibody, cell lysis) and polysaccharides into small pieces (Figure 8A). In comparison, IONzyme or H2O2 applied separately failed to complement the oxidative degradation . The capability of cleaving biomolecules allows the Fe3O4 NP-H2O2 system to efficiently break down the existing biofilm matrix and prevent new biofilms from forming, killing both planktonic bacteria and those within the biofilm, providing a novel strategy for biofilm elimination and other applications. This strategy has been successfully applied in dental biofilm elimination and caries prevention  (Figure 8B-D). IONzyme with its peroxidase-like activity not only effectively degrades glucans from oral biofilm matrixes into glucose, but also dramatically kills the embedded Streptococcus mutans (S. mutans) from 108 CFU/ml to 102 CFU/ml (up to 6 log reduction). Moreover, it displays an additional property of reducing apatite demineralization under acidic conditions. In topical daily treatments akin to a clinical situation, IONzyme in combination with H2O2 effectively suppressed the onset and severity of dental caries while sparing normal tissues in vivo (Figure 8D). 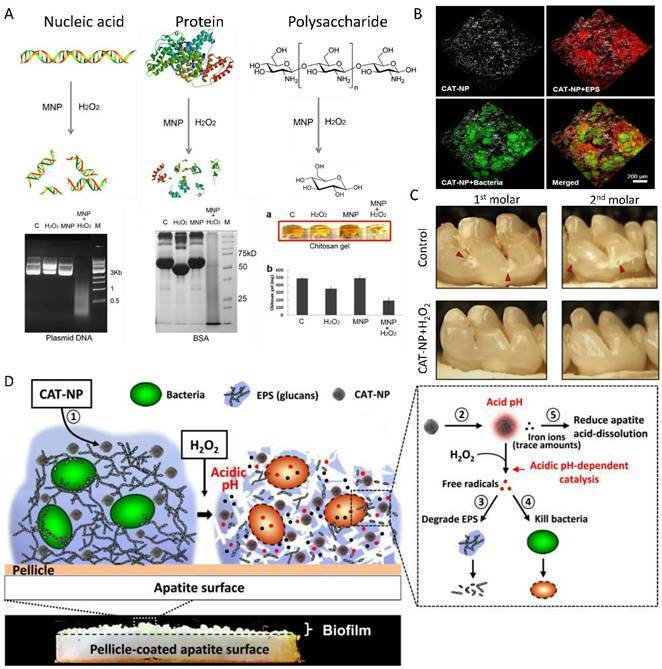 These results revealed the potential to exploit nanozymes as a potent alternative approach for treatment of the prevalent biofilm-associated disease. IONzyme for biofilm elimination and dental caries prevention. (A) Degradation of nucleic acid, protein and polysaccharide with IONzyme . (B) 3D distribution of IONzyme in oral biofilm . (C) Dental caries prevention with IONzyme . (D) Multiple functions of IONzyme in dental application . Reproduced with permission from references  . Since iron oxide nanoparticles with enzyme-like activity were first found, a question has arisen: do they maintain their enzymatic function in a living cell or in vivo? Indeed, iron oxide nanoparticles are often used as a contrast agent for in vivo cancer imaging or carrier for drug delivery. Therefore, their influence on cell viability needs to be thoroughly considered. They may change the level of reactive oxygen species (ROS) by diminishing H2O2 or generating free radicals. As introduced previously, IONzyme demonstrated dual enzyme-like activities, peroxidase and catalase, under acidic and neutral pH, respectively  (Figure 9A). Therefore, contradictory outcomes may be obtained in various organelles and cytosomes having different intracellular microenvironments. For example, in lysosome mimic conditions, the nanozyme could catalyze H2O2 to produce hydroxyl radicals, which induce cell damage dramatically. However, it may diminish H2O2 in neutral cytosol mimic conditions, because of the decomposition of H2O2 into H2O and O2 directly. The dual activities should be taken into consideration when evaluating the cytotoxicity based on the intracellular location of IONzyme. Besides this potential ROS impact, IONzyme may also cause liposome membrane damage due to lipid oxidation , which can catalyze pre-existing lipid peroxides (LOOH) or H2O2 as a substrate to initiate the chain reaction process. Until now, many types of iron oxide nanoparticles were found having high biocompatibility and biosafety with mammalian cells, indicating that the adverse influence from the intrinsic activity of IONzyme may not be very significant to the cells. ROS modulation with IONzyme. (A) Dual enzyme-like activities in the cell . (B) Stimulation on stem cell proliferation . (C) Cardioprotective activity . (D) Aging delay and neurodegeneration amelioration in Drosophila . Reproduced with permission from references    . In contrast, beneficial effects of IONzyme are observed with stem cells. Ferucarbotran, an ionic SPIO, was found to increase human mesenchymal stem cell (hMSCs) proliferation due to its ability to diminish intracellular H2O2 through intrinsic peroxidase-like activity and accelerate cell cycle progression mediated by the free iron released from lysosomal degradation to alter the expression of the protein regulators of the cell cycle  (Figure 9B). Similarly, poly(L-lysine)-modified Fe3O4 nanoparticles could promote the proliferation of cancer stem cells from U251 glioblastoma multiform by reducing intracellular H2O2 . These results indicate that IONzyme may have more influence on stem cells because ROS signaling is critical for nuclear reprogramming . IONzymes show more positive effects in in vivo testing. First, Fe2O3 NPs were found to protect hearts from ischemic damage at the tissue and cell level in a model of ischemia and reperfusion (IR). One potential mechanism is that these nanoparticles may inhibit the intracellular ROS and decrease the peroxidation injury  (Figure 9C). More interestingly, Zhang et al. found that dietary iron oxide nanoparticles can delay aging and ameliorate neurodegeneration in Drosophila  (Figure 9D). Intracellular Fe3O4 NPs showed neuroprotective ability in a PD cell model by diminishing α-Synuclein accumulation and Caspase-3 activation. More significantly, dietary Fe3O4 NPs could enhance the climbing ability of aged Drosophila and prolong their life span by reducing in vivo ROS levels. In addition, these nanoparticles could alleviate neurodegeneration and increase longevity in a Drosophila AD model. All these beneficial functions of Fe3O4 NPs may be ascribed to the catalase-like activity reducing intracellular oxidative stress. Although promising results are displayed, the cellular roles of IONzyme still need to be evaluated carefully, as some work has reported it may increase ROS levels . 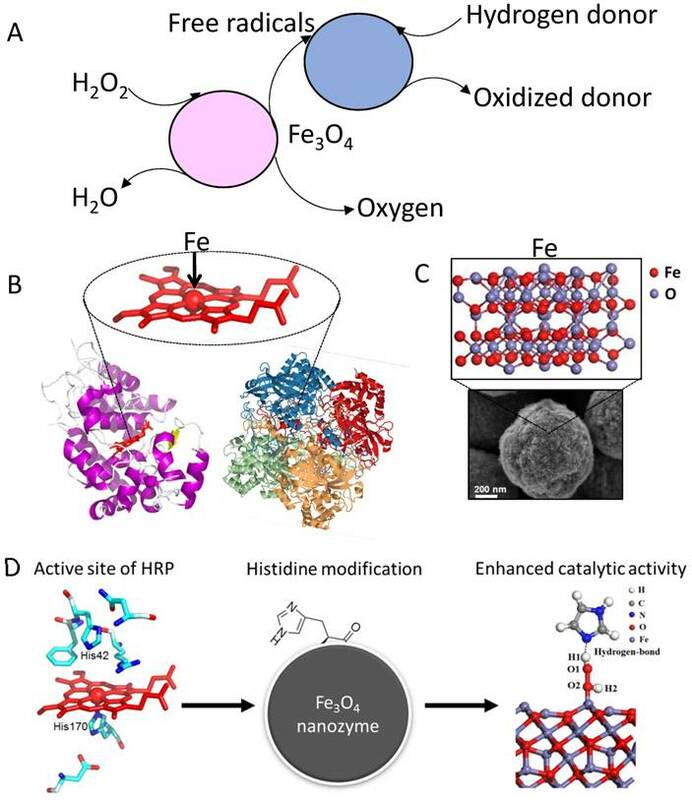 Taken together, the enzyme-like activities of IONzyme provide a new way to understand the potential functions of iron oxide nanomaterials taken up by the cell and may be used to control cellular ROS for therapeutic purposes. It has been a decade since intrinsic enzyme-like activity was first discovered in iron oxide nanoparticles. As a new generation of enzyme mimetics, the catalytic behaviors and kinetics of IONzyme have been systematically investigated to understand the mechanism and further improve its activity by controlling certain parameters, such as the size, morphology, nanostructure, dopants and surface modification or integration with other nanomaterials, which enables us to rationally design the proper nanozymes according to the practical applications. Compared to traditional enzyme mimetics or natural enzymes, IONzyme has much better stability and is a multifunctional and versatile platform able to be functionalized with additional molecules or labels. These advantages have opened a new way to use iron oxide nanomaterials independent of magnetism. It is already known that magnetic iron oxide materials have been widely used in biomedical and clinics, such as in DNA extraction, gene delivery, cell sorting and tumor imaging. For example, they can be used to sort T-cells for chimeric antigen receptor (CAR) T-cell therapy, which is one of the most promising immunotherapies for cancer treatment. All these applications are based on the magnetism of these materials. The enzyme-like activities will bring extra benefits in medical applications, such as immunoassays and pathogen detection, tumor diagnosis and therapy, biofilm elimination and ROS modulations at multi-levels for cell differentiation, cardioprotection and neuroprotection. 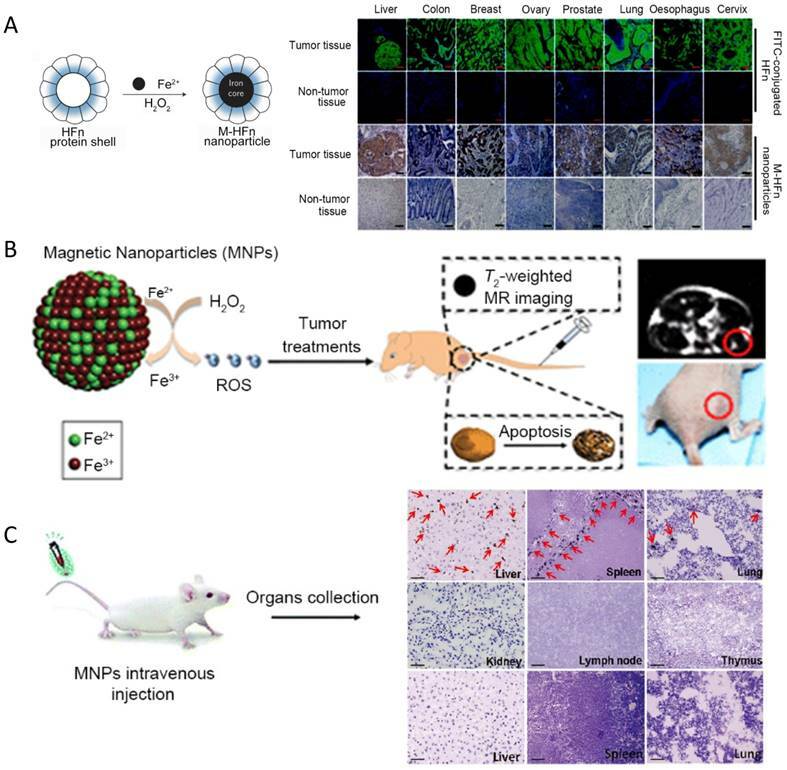 More encouraging findings are that by in vivo ROS regulation, iron oxide nanomaterials not only polarize the macrophage cells and stimulate immune attack in tumor tissue , but also induce ferroptosis directly to inhibit tumor growth . The enzyme-like activities of IONzyme may inspire more cutting-edge technologies in many important fields to improve human health. Although many types of IONzymes have been reported, some fundamental challenges need to be addressed. (1) There is still no standard way to evaluate and compare the activity level between IONzymes from different preparations and modifications and nanozymes from different nanomaterials. For simple comparison, the specific activity can be considered for evaluate the enzyme activity defined as the Unit per certain amount of enzyme proteins. More in-depth evaluation can be achieved by determining the kinetic parameters including KM, Kcat or Kcat/KM. However, the necessary prerequisite for these comparisons is that the reaction conditions must be the same, including substrate and concentration, pH, temperature and buffer. (2) The activities of IONzyme are still lower than natural enzymes and the way to improve its selectivity is still limited. A potential approach is to refer to the catalytic mechanism and molecular structure of the active site in natural enzymes. The features of the interaction between substrate and enzyme will help to design certain nanostructures to improve the selectivity. Liu's group just reported that a new technique using molecular imprinting may improve the selectivity of IONzyme . (3) Current activities of IONzyme are limited to mimicking just peroxidase and catalase. Actually, there are hundreds of natural enzymes using iron as the cofactor for their catalysis besides the redox reaction. It is still challenging to design an IONzyme with a needed activity. The potential pathway may still lie in learning the structure and mechanism of natural enzymes. (4) Although some beneficial effects have been demonstrated, the intracellular role of IONzyme remains unclear, especially for correlations among the catalytic activity, therapeutic effect and biocompatibility in vivo. 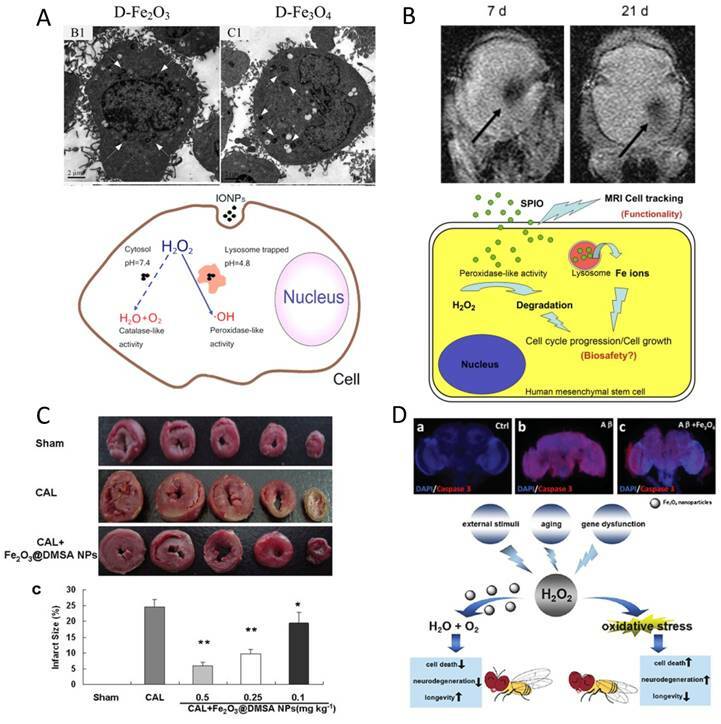 For instance, iron oxide nanoparticles have already been used for tumor in vivo MRI with clinical permission, but the biocompatibility needs to be carefully evaluated with respect to their intrinsic peroxidase/catalase-like activities. The ultimate influence on ROS-sensitive biological systems need to be carefully investigated, including immune activation, neural development, heart stress, stem cell proliferation and differentiation and tumor growth. Therefore, great efforts are needed to tackle the fundamental challenges and further improve the activity of IONzyme for both in vitro and in vivo biomedical applications. This work was supported by the Foundation of the Thousand Talents Plan for Young Professionals and Jiangsu Specially-Appointed Professor, Young Elite Scientist Sponsorship Program by CAST, Beijing Natural Science Foundation (Grant No. 5164037), China Postdoctoral Science Foundation (Grant No. 2015M570158) and the China Postdoctoral Science Special Foundation (Grant No. 2016T90143), Strategic Priority Research Program of the Chinese Academy of Sciences (Grant No. XDA09030306), National Natural Science Foundation of China (Grant No. 31530026 and 81671810), Key Research Program of Frontier Sciences, CAS (Grant No. QYZDB-SSW-SMC013) and Natural Science Foundation of Jiangsu, China (BK20161333).